I had a mini class last week with a couple of my friends. We played all afternoon with color and Zenstones. The time flew. Both of them shared things they had been working on. I was influenced and inspired by both of them. 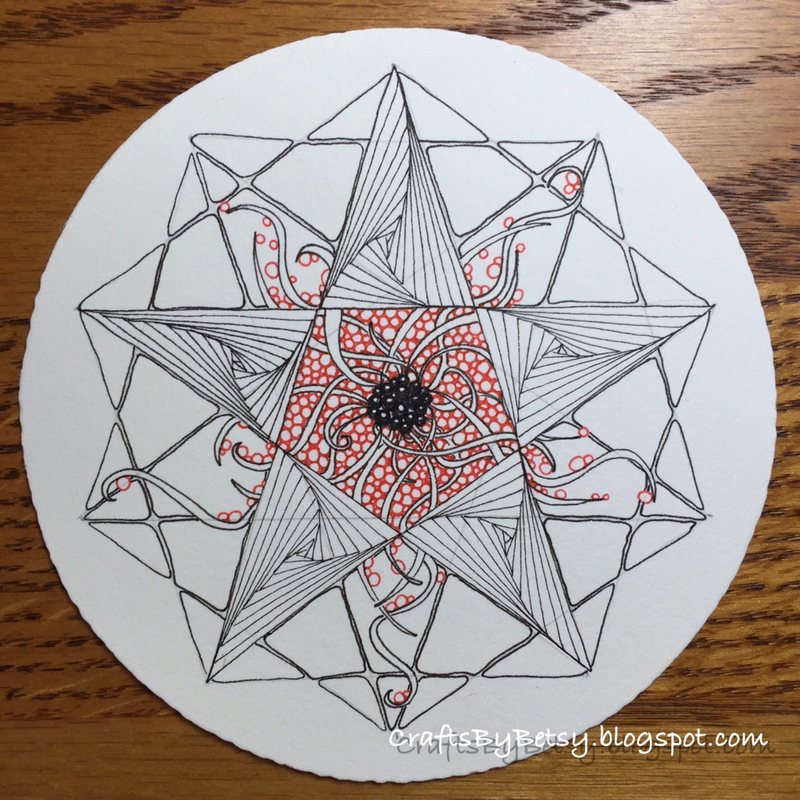 Deana had a set of Zendalas in white, black and red. I hadn't worked with those colors in awhile and decided I needed to! Terry showed me how she had been working on Paradox. She gave me a beautiful card incorporating it. 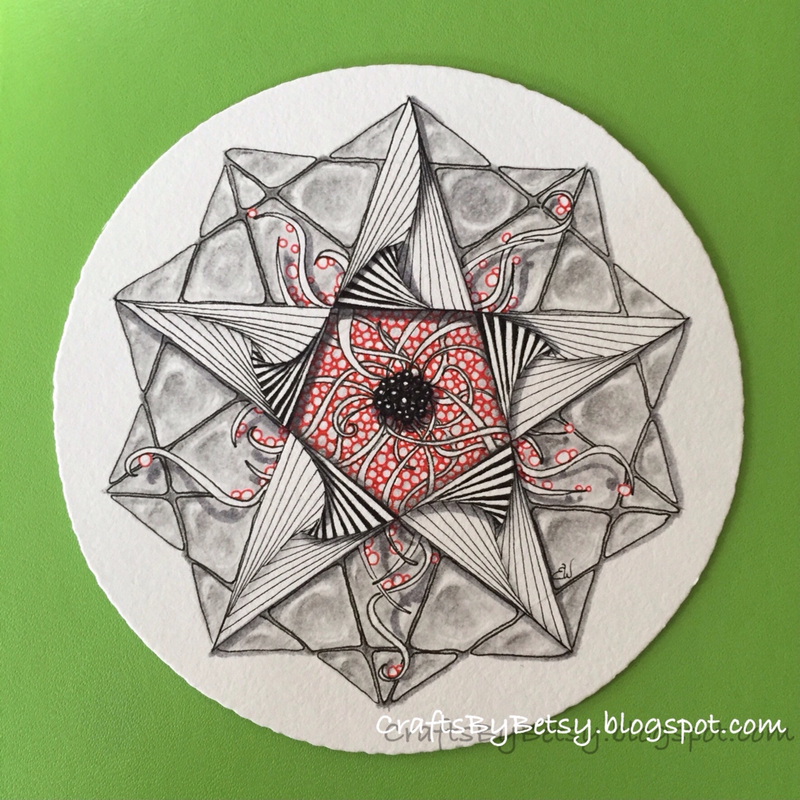 So, the next day, I started a black, red and white Zendala using Paradox and incorporating our Zenstones using graphite. I finished it up this weekend. Then today, Monday, the Diva challenge #272 is black, white and red all over! 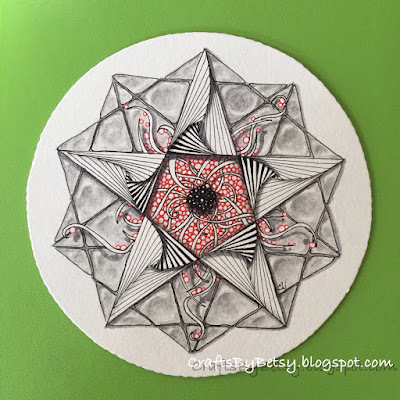 Zentangle® and serendipity. They just go together. Tangles are Paradox (with Triangulation technique), Squid and 'Nzeppel. Check back on Friday for pictures from the class. Thanks for stopping by! Wonderful Zendala. I love how you incorporated 'Nzeppel into this. The red is great in your Squid. Really enhances the whole tile. Both Zendalas are beautiful in their own ways. I love the darker lines of paradox in the top one and the way the tendrils of Squill slide over the top of 'Nzeppel. Beautiful, the touch of red really adds some zing! Beautiful combination of patterns and the subtile red accents make your Zendalatile even more splendid! Both are beautiful Zendalas. I think the first one is quite dramatic with the darker look to it. Very beautiful! I love the first one! This is a really pretty tile and love the squid. I just used this in a tile myself recently. Love it! Oh my! How beautiful. I absolutely love the stone texture you got on the 'nzeppel bits. Fantastic Zedndala, I love it! Wonderful Zendalas! The first one is my favorite. Great 3D effect! The Squid is such a beauty with the geometric shapes of Paradox and N'Zeppel. Gorgeous! The shading on your N'Zeppel is glorious!